Max and Rosie love road trips, even if it's a short ride to school or to the store, especially when they can sing along to their favorite traveling songs. 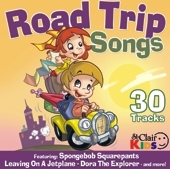 3o great songs on this CD featuring Spongebob Squarepants theme, Leaving on a Jetplane, dora The Explorer theme and more! !